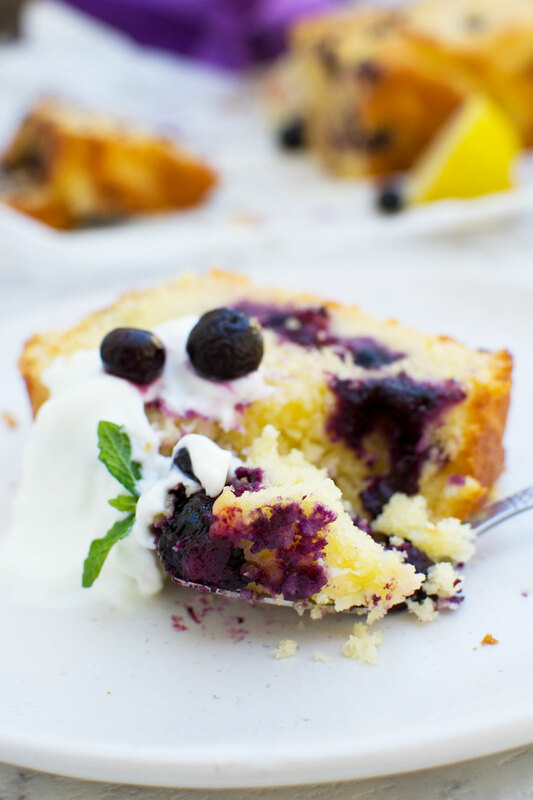 This sticky blueberry lemon curd cake takes the crowd pleasing lemon blueberry combination to another level. Swirl layers of tangy lemon curd and blueberries into the cake batter for a delicious sticky treat. Do you spot the common theme? Yup, most of the cakes I post here involve CHOCOLATE, and lots of it, but I’m also a big fan of lemon cakes, and I’m obviously not alone. A quick Google search for lemon cake returns about 75,000 results. Blueberry lemon cake returns about 18,000 results. The blueberry lemon cake combo is clearly a crowd pleaser, and I decided to see how I could take it to another level. If you’re looking for a cake to make for an afternoon tea with family or friends, you couldn’t go far wrong with this sticky blueberry lemon curd cake. 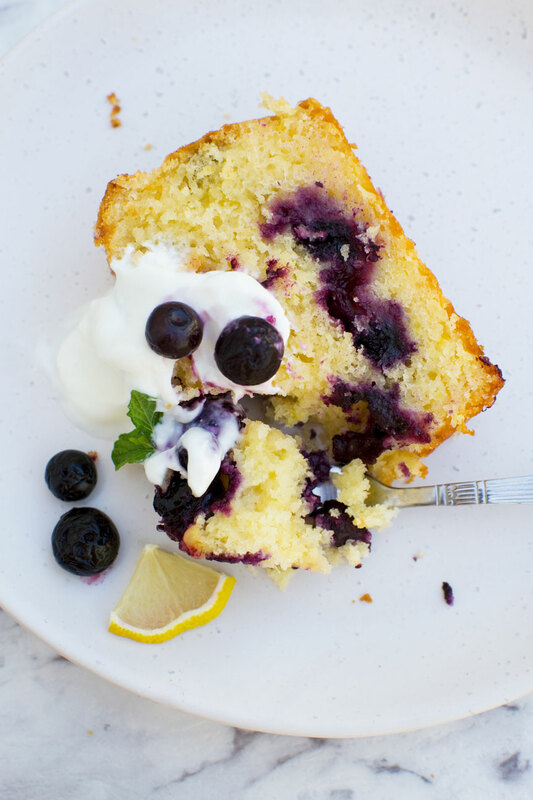 If you’ve ever made a plain vanilla cake by creaming together the butter and sugar and then adding eggs and flour, you’ll find this sticky blueberry lemon curd cake a cinch to make. Add lemon zest and juice and yogurt to the basic batter, then layer up in a loaf tin with blueberries and swirled lemon curd (scroll down for the handy how-to video). I find this to be a sweet cake, but not sickly sweet. The lemon curd adds sweetness, but to compensate I reduced the amount of sugar in the original recipe for the cake batter by about a third. The cake takes a full hour and 10 minutes in the oven at a lowish temperature to bake. This might seem like a long time but you’ll be rewarded with a moist but at the same time springy and light cake with a slightly crispy, sticky top. 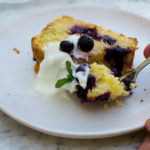 I like this sticky blueberry lemon curd cake best served slightly warm with a big spoonful of Greek yogurt on top. But that’s just because I’m addicted to Greek yogurt. I use it instead of mayonnaise or sour cream, I stir it into cake and muffin batter, I add it to dips, and don’t be disgusted but I even smear it onto pizza. Mmmm. Anyway, I digress. If you’re not as big a fan as me of Greek yogurt, though, feel free to serve this loaf cake with whipped cream or ice cream. Throw on a few more blueberries and another spoonful of lemon curd and you have a gorgeous crowd-pleasing dessert. Or by all means just serve it as it is with a nice hot cup of tea. 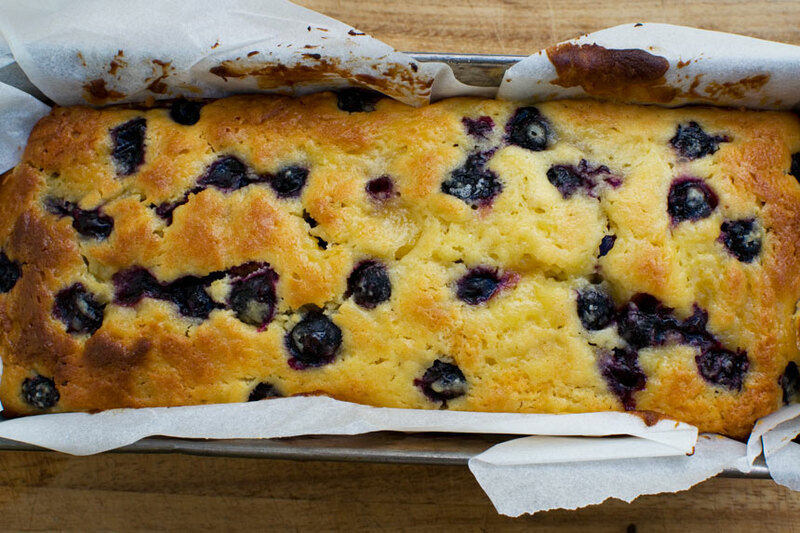 A beautiful sticky and yet not overly sweet loaf cake packed with fresh blueberries and pockets and swirls of lemon curd. Perfect for a lazy afternoon tea. Pre-heat the oven to 320F/160C and line a loaf tin (I used a 9 x 5 inch tin) with baking paper. 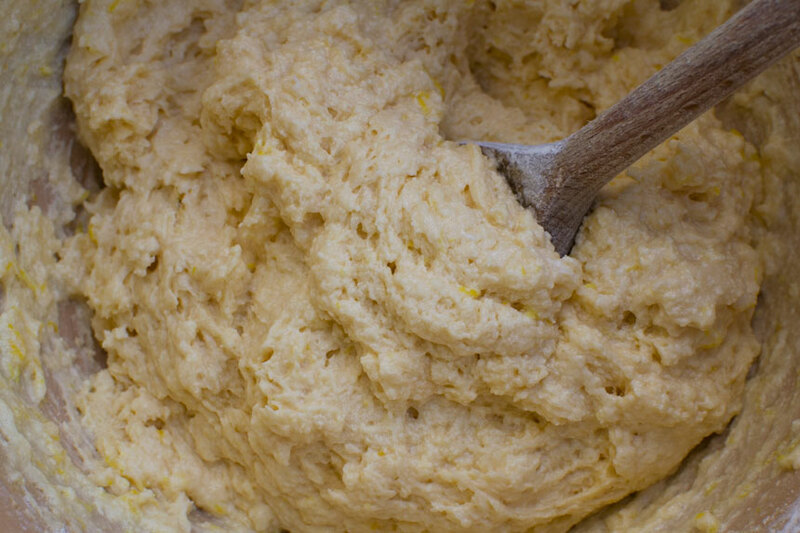 Cream together the butter and sugar with a handheld mixer. Whisk in the eggs one by one, then stir in the yoghurt. Fold through the flour, then stir in the lemon zest and juice. Roll most of the blueberries lightly in flour (this stops them from sinking). Pour a layer of cake batter into the prepared baking tin, then spoon and slightly swirl some of the lemon curd over it. Scatter some of the blueberries on top, then pour in the rest of the batter. Finally, dot the rest of the lemon curd on top and swirl it a little again and lightly press in the rest of the floured blueberries. Bake the cake for about 1 hour and 10 minutes or until it is golden and a skewer pushed into the centre comes out clean. Cool the cake in the tin for a while, then lift onto a cooling rack. 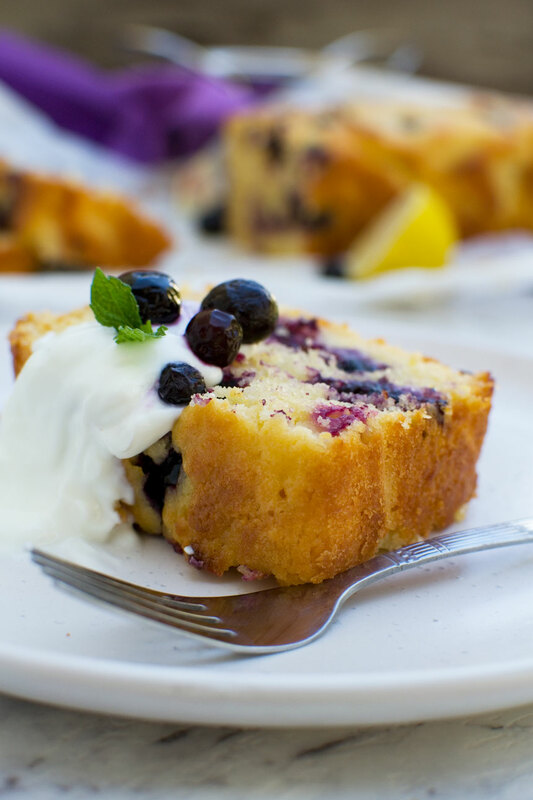 Serve when the cake is still slightly warm with a dollop of Greek yoghurt and reserved blueberries on top. I first published this post on 20th June 2014. Updated with new photos, writing, and a video. Oh la la, j’adore le tea time et avec un cake comme ça, c’est encore mieux! Il pareil tellement bon ! J’ai bien aimée aussi tes photos! Merci, Eva … et pour le compliment sur les photos! Bon weekend et toi aussi! Ahhhh … you should definitely book an afternoon tea at one of the hotels when you go to London, Samina! That’s exciting – have you been to London before? Glad you enjoyed the quiz – I was thinking it might be too easy so I’m happy you didn’t guess til the end! So happy you like the cake, too. It was beautiful and I definitely want to make it asap again! Hi, Sofia! I actually bought the lemon curd, which is found in every supermarket in England, but I gather it’s very easy to make yourself. My mum used to make it when I was little. It’s just lemons, butter, eggs and sugar, I think. So glad you like the cake! 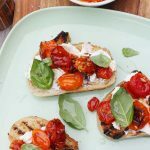 I can’t tell you how often I’m guilty of surfing Pinterest looking for this very recipe! Lemon curd with blueberry cake! Yes please. And I’m so glad you’re not even trying to call this a bread. It’s that desserty breakfast, lunch, dinner and yes, afternoon tea that we all crave. Downton Abbey & Agatha Christie, yes please! Tea at Claridge’s and the Ritz Cartlton? Oh yes. Clotted cream. Oh so English. I want a piece right now! Haha … no, this definitely isn’t a bread. It’s cake all the way! I think I’ve only ever had one posh London afternoon tea and that was years ago, so I think I’m due another again soon. Maybe I should save up and go to Claridge’s. Very English indeed but also very worth it every once in a while. What a great post, Helen! I was thinking tea by the end of your questions…so great clues! As soon as I read lemon curd in the title, I knew I would love this cake! I think lemon curd and blueberries make such a great combination. This is definitely a great cake for the summer. My daughter loves to drink tea, but I am more of a coffee girl. Your pictures are absolutely gorgeous. Such pretty warm light to complement the yellows and blues. Lemons and blueberries are such a great combination! Thanks so much for the compliments on the photos, Christin. A little overexposed perhaps, but I think these particular piccies make the cake look more delicious like that. I must say as well, lemons and blueberries are definitely a match made in heaven! Loved your little guess game! Nothing like a nice afternoon tea. 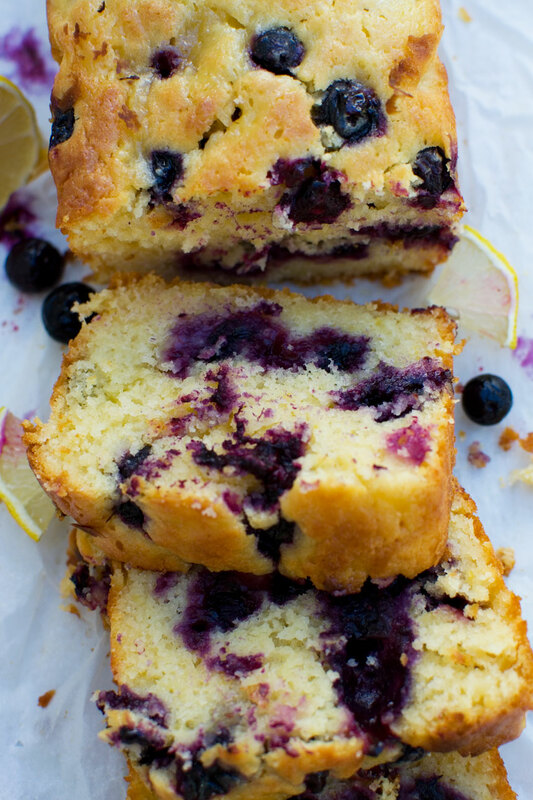 This lemon curd and blueberry cake sounds delicious! Love that’s it’s sticky. So glad you liked the cake. I loved the ‘sticky’ part too! Thanks, Jess! Making my own lemon curd is definitely on my food bucket list. I love that stuff, and it would make a great gift, too. Hope you do give this a try … I really don’t think you’ll be disappointed and you could probably even make little cakes, too. We both have blueberries and lemon the brain today! 🙂 This looks super delicious!! I couldn’t guess until you got to the easier clues. But this bread, OMG, I love it. It looks scrumptious and would go perfect with afternoon tea. Come to think of it, It’s been too long since I’ve been to tea! So happy you like the cake, too. Maybe I’ve inspired you to have an afternoon tea yourself some time soon! I have an obsession with afternoon tea and have enjoyed many different versions. My latest blog post is in fact my birthday afternoon tea a couple of weeks ago. I thoroughly enjoyed your post and thank you for the recipe. This cake looks so light and the flavours sound perfect. I’m delighted to have stumbled across your lovely blog and I’m now following along! Hello, Miss B! Every once in a while a comment makes my day, and yours definitely falls into that category! Thanks so much for the compliments and I’ll definitely be heading over to check out your blog, too. I love making friends with bloggers from the UK, too. I’ll be back there in September! I love a good afternoon tea, but I think 100 dollars would be my limit! Better yet, I’d love to make my own…starting with this lovely cake! Even a hundred dollars seems a bit expensive to me, but then I suppose if it was REALLY good and a special treat it would be just about OK. I agree though that the best solution is to make your own … a slice of cake feels more justified when you are eating it as part of a meal rather than after it. I LOVE lemon curd, and I never would have thought to add it directly to the bread- I just slather it on the already cooked loaf. DEFINITELY doing this! I am obsessed with lemon curd and will eat it straight-up. Pairing the lemon and blueberries, oh em gee. I am dying for a slice of this for breakfast right now! Perhaps we will be in the same corner of the world sometime in the future and we can have our own little afternoon tea 🙂 Preferably with this cake! Also, I would love to know how to make a real cup of tea. I can brew coffee, but tea is another story! First of all, there are two ways of making it, in a pot or in a cup. Making it from loose tea leaves in a pot is the best way, of course, but for the sake of moving with the times, I’ll concentrate on the other way 😉 So … you boil the kettle (always to 100% if it’s black tea) and pour your water onto your tea bag which will be there waiting patiently in your cup or mug. You then leave it to infuse for about 3 minutes, take out the tea bag, then add a little bit of milk. I find that a lot of the tea I find when I go abroad isn’t strong enough because it’s meant to be drunk without milk, but a proper English cup of tea is always drunk with milk so I’d advise finding a really good brand of stronger tea, like Twinings. TMI? Sorry, I got a bit carried away there! So glad you enjoyed the quiz and YES, if our paths ever cross in real life, we’re going for afternoon tea! Oh Helen, your afternoon tea sounds so lovely! Consider me slightly jealous 😉 No wonder this got so many oohs and ahhs! It is beautiful! And I’m falling just as hard for this swirled cake as your peanut butter one. I’ve been trying to find the perfect use for the lemon curd in the pantry – a blueberry lemon bread sounds delicious! Thanks for sharing, pinned! And hope you are having a fantastic weekend! Thanks so much for the lovely thoughts, as usual, Mary Frances. I’m definitely getting a bit obsessed with the swirly cakes thing, but they’re really good! I love to really taste certain ingredients, and lemon curd is one of them. Thanks for the pin and I hope you’re having a great weekend, too! And a massive thank you goes to the Duchess of Bedford. What better to lift yourself up in the afternoon than nice tea and cakes. I love the freshness of this cake, lemon curd is an absolute must in my cupboard, always. Lemon curd is something I love but don’t always remember to buy and eat. It’s definitely on my food bucket list to try making some of my own! We definitely do need to thank the Duchess of Bedford, don’t we? The horror of life without afternoon tea! Haha when I saw Alice, my favourite kid’s book ever, I got it!! This cake looks so yummy and perfect to carry to an afternoon tea! Oh I’m excited! 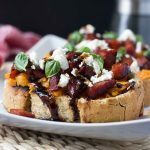 One of the my favourite things to make at home is sweet loaves – this one looks fab! Afternoon tea is a true favorite of mine een though I’m not English. Especially when cake is involved. Especially x2 when said cake is smothered with a generous amout of lemon curd OH HOW GLORIOUS! This loaf looks absolutely delicious and the texture seems perrrrrrrrrrrrfect. I need this! Hehehe … I’m actually glad you said that, Cindy, because I was worried that the quiz was too easy. Very happy that you like the cake! This cake sounds so so good. I mean lemon and blueberry is such an awesome combo to begin with … and I love that you used lemon curd! Hi Helen, what a fun post, I had no clue going through your questions until the Downton Abbey, then I got it. Love this little cake. Ha! So glad you got it in the end. I think I got the ‘level’ of the quiz just about right judging by the feedback .. haha! So glad you like the cake! Who doesn’t love a good spot of afternoon tea? Also, who doesn’t love lemon curd? This cake looks delicious and almost amazing as your writing 🙂 The caption on that painting had me laughing out loud! Aww, thanks Medha! You certainly know how to make a humble food blogger’s day! So glad to have made you smile … and happy you liked the cake, too. Okay, hold on. $9000 for TEA. That is crazy. And people actually pay for it?! I would much rather bake up this luscious loaf and brew the tea myself thankyouverymuch! Well, aren’t you a fancy girl with your nice little afternoon tea 🙂 ! I am not big on lemony stuff but I must admit that this cake was kind of calling my name… I ought to try it, what time shall I stop by 🙂 ? Love this post and love afternoon tea. You know what would be perfect with the tea? This cake! You know when else this cake would be great for? Every single second! Looks amazing! I’m very much a coffee girl rather than tea but I wouldn’t say no to a slice of that cake Helen! It looks lovely and I think the swirl of lemon curd and blueberries on top make it look really rather special! Aw, thanks, Sian! I have some blueberries in the freezer that I think I’m going to use to make this again soon. Sorry to blow my own trumpet here, but it really was delicious, especially still a little warm straight out of the oven. I’m dying to dig into a slice of this bread, Helen. The first site of the words Lemon Curd made me start to drool. What a fantastic recipe! While I’m a coffee drinker, I do love tea. And sometimes I prefer a cup of hot tea over a cup of coffee. And I LOVE a big glass of unsweet iced tea on a hot day! So happy you like it, Julie. I’ve been craving another big slice of this ever since I made it and we gobbled it up super fast. I alternate my coffee and tea drinking, too, and altogether probably drink a bit too much! Oooh, thanks so much, Lorraine! This is one of my fave cakes on the blog. It’s super delicious and I’m so glad you found it! This looks beautiful, thanks for sharing this delicious recipe. Thank you, Simon, and you’re welcome. Hope you give it a go some time! This looks so scrumptious! I can’t wait to taste it. Hi! Thank you! 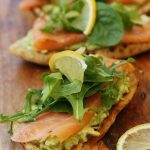 This is absolutely delicious and now you’ve reminded me to make it again! Well, I couldn’t agree more — lemon is my favorite flavor and I simply adore blueberries. Your cake looks so moist and flavorful!! It would be a hit in our house because citrus reigns!! I’m looking forward to making and enjoying it. Thank you Marisa! Please let me know if you do try it! I’m all about blueberries this time of year! The blueberry lemon combo is fantastic! Glad you like it, Marjory. Thank you! The photos are enticing but I really like videos, which, I find, give me more of a feel for the process but couldn’t find the link to the video anywhere. Am I missing it? Hi Vicky! Oh no! I’m so sorry about that. The video is just above the recipe card. If you can’t see it, do you have Flash Player enabled in your browser? It might be that. Otherwise, please do let me know because the next video I do I’m going to embed it in the recipe card. If it isn’t Flash stopping you from seeing the blueberry video then I’ll try embedding it in the recipe card to see if that helps! You could also try viewing my site in a different browser? I’m glad you’ve let me know because others might be having the same problem. Thanks for responding. I downloaded Flash but the video link but sadly it the video. still doesn’t activate. Technology is great when it works but can be areal puzzle when it doesn’t. Am planning to try your recipe tomorrow and will let you know hoe it turns out. Oh no! Sorry, Vicky! Can you see the video in my latest post (How to make a Greek salad)? It’s within the recipe post. I’m hoping you’ll be able to see this because I’ve attached it to the post in a different way. If you can I’ll do the same in the blueberry cake post! Lemon and blueberry is such a heavenly combo! Can’t wait to make this recipe over the weekend! Hope you enjoy it, Sean! I’ve rated this 5 star since without trying it. Simply because you have provided the metric measurements even though you are American and are used to using cups. Incredibly helpful as it’s always frustrating to see recipes where only cups are listed since they are so imprecise. Thank you and I will be using this recipe. Hi Paul – thank you so much for your complimentary comment! I’m actually not American – I’m British! Hence the metric measurements (insert slightly sheepish grin here). I had to decide which measurement to make my default and although at least half of my readers are British I went with cups first as readership does tip more towards the US sometimes. Still, I’m like you and mostly prefer metric. I really hope you enjoy the recipe! Hi Sofia! Thank you so much for taking the time to pop back and comment. I’m so glad you like the cake as much as we do! I’ve made this so many times and it never disappoints. Warm out of the oven… mmmm! Hi Rana! Oh, you’ve made my day! I had a bit of a dessert fail today, so it’s good to be reminded of my failsafe classics. Every time I’ve made it this cake has gone down very well too. We love it, and I’m so glad you enjoyed it too! As for the blueberry muffins, well, my husband’s exactly the same as yours. He generally doesn’t care for muffins at all, but he LOVES these! I’ve made them so many times. Sometimes I have to add a bit more milk, sometimes I make big ones, sometimes I make small ones, and the cooking time can vary a bit, but I find they always turn out delicious. Thanks again for taking the time to let me know what you thought, and to leave such a lovely review. Hope you’re having a great weekend! P.S. I’ve tried the muffins with chocolate chips instead of blueberries, and they were quite nice too! Hello how long does the cake last I. Fridge or is it possible to freeze? Hi Lauren! This cake actually stays nice and moist for a few days. We eat it pretty quickly at our house, but if you’d like it to last for longer then it freezes brilliantly! Just wrap well and freeze! Great little bake, the perfect way to use up some lemon curd I made last week! So glad you enjoyed it, and thank you for the feedback! I had bookmarked this recipe ever since I discovered your blog when searching for cake recipes using both blueberry and LEMON CURD. I made this yesterday for lunch for a group of friends where I also made your creamy garlic parmesan potatoes as a side for the main and it was the most amazing meal ever…. 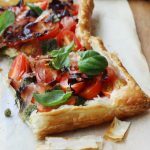 I shared your blog with friends and the food was well received, incredibly tasty and indulgent – the cake was VERY moist, quite light and refreshing (the greek yoghurt is such a lovely addition here) AND NOT SICKLY SWEET which was a fantastic bonus (thanks for the adaptation). It’s going to be a staple in my home from now on (a reliable go to)…I’ll gradually start working my way through your recipes..
Hello Deji! Oh, you’ve made my day! Thank you so much for such a complimentary review. I’m so pleased that these recipes worked out well for you. There’s another potato recipe that you might like that’s a bit similar but without the cream (potatoes boulangere). Also goes really well as a side! As for the cake, you wouldn’t believe it but this is probably one of the sweeter cakes on the blog. I usually cut down the sugar as much as I can without compromising the flavor, and I’m so glad you think it had just the right amount of sweetness. Thanks again for taking the time to pop back here, and of course for sharing the blog with your friends. That means so much to me!